James Steven Rogers. 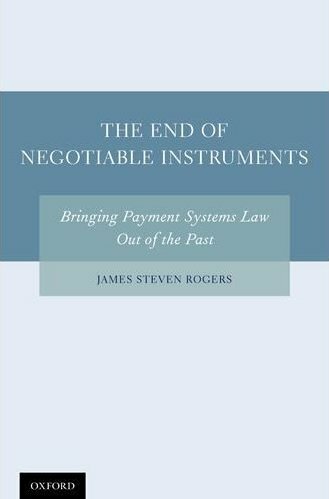 The end of negotiable instruments : bringing payment systems law out of the past. Oxford University Press, c2011. The modern American law of payment systems is in disarray. Efforts to create a unified body of law for payment systems have so far been unsuccessful. Part of the reason for that failure is the assumption that the existing law works well for the traditional paper-based check system, and that problems have been created only by the evolution of new technologies. This book challenges the basic assumptions of the law of checks and notes and its history, and provides a well-reasoned account of how the law could be changed to better suit the evolution of new payment technologies. Mel A. Topf. 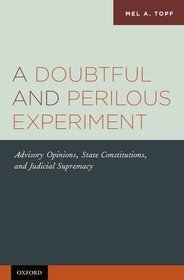 A doubtful and perilous experiment : advisory opinions, state constitutions, and judicial supremacy. Oxford University Press, c2011. This book provides a comprehensive treatment of the history, concept, jurisprudence and controversies relating to state Supreme Court advisory opinions. Though just ten states have adopted such advisory opinions (many others have debated but rejected them), they have been implicated in major issues regarding American judicial power. The book explains the-so far unexplained-first appearance of advisory authority in 1780, and address the persistent aura of illegitimacy that has always shadowed this authority. Ashley Saunders Lipson. Mathematics, physics and finance for the legal profession. Carolina Academic Press, c2011. James R. Acker, Allison D. Redlich. Wrongful conviction : law, science, and policy. Carolina Academic Press, c2011. Stephen Elias, Kevin Urbatsch. Special needs trusts : protect your child's financial future. 4th ed. Nolo, 2011. Howard C. Anawalt. Idea rights : a guide to intellectual property. Carolina Academic Press, c2011. Sarah E. Redfield. Thinking like a lawyer : an educator's guide to legal analysis and research. 2nd ed. Carolina Academic Press, c2011. John D. Edwards, et al. Iowa legal research. Carolina Academic Press, c2011. Wanda M. Temm, Julie M. Cheslik. Missouri legal research. 2nd ed. Carolina Academic Press, c2011. Ralph H. Folsom. NAFTA and free trade in the Americas in a nutshell. 4th ed. West Group, 2012. Morgan D. Rosenberg. The essentials of patent claim drafting. Oxford University Press, c2012. Camilla E. Watson. Tax procedure and tax fraud in a nutshell. 4th ed. West, c2012. Courts and terrorism : nine nations balance rights and security / edited by Mary L. Volcansek, John F. Stack, Jr. Cambridge University Press, 2011. Perspectives on the crisis in Libya : hearing before the Committee on Foreign Relations, United States Senate, One Hundred Twelfth Congress, first session, April 6, 2011. Climate science and EPA's greenhouse gas regulations : hearing before the Subcommittee on Energy and Power of the Committee on Energy and Commerce, House of Representatives, One Hundred Twelfth Congress, first session, March 8, 2011. Red to black : improving collection of delinquent debt owed to the government : hearing before the Subcommittee on Government Organization, Efficiency, and Financial Management of the Committee on Oversight and Government Reform, House of Representatives, One Hundred Twelfth Congress, first session, March 11, 2011. Protecting patients from defective medical devices : hearing of the Committee on Health Education, Labor, and Pensions, United States Senate, One Hundred Eleventh Congress, first session, on examining S. 540, to amend the Federal Food, Drug, and Cosmetic Act with respect to liability under state and local requirements respecting devices, August 4, 2009. The stimulus : two years later : hearing before the Subcommittee on Regulatory Affairs, Stimulus Oversight, and Government Spending of the Committee on Oversight and Government Reform, House of Representatives, One Hundred Twelfth Congress, first session, February 16, 2011. Obamacare : why the need for waivers? : hearing before the Subcommittee on Health Care, District of Columbia, Census, and the National Archives of the Committee on Oversight and Government Reform, House of Representatives, One Hundred Twelfth Congress, first session, March 15, 2011. Mortgage finance reform : an examination of the Obama administration's report to Congress : hearing before the Committee on Financial Services, U.S. House of Representatives, One Hundred Twelfth Congress, first session, March 1, 2011. Iran and Syria : next steps : hearing before the Committee on Foreign Affairs, House of Representatives, One Hundred Twelfth Congress, first session, June 23, 2011. Directing the Secretary of State to transmit to the House of Representatives copies of any document, record, memo, correspondence, or other communication of the Department of State, or any portion of such communication, that refers or relates to any consultation with Congress regarding Operation Odyssey Dawn or military actions in or against Libya : markup before the Committee on Foreign Affairs, House of Representatives, One Hundred Twelfth Congress, first session, on H. Res. 209, May 11, 2011.